after he was returned from foster care. A review hearing will be held in two weeks. Until then, the parents can have unsupervised visits with Christopher while the state puts in place a plan to gradually reunite Christopher with Fabbrini and Ziegler without abruptly taking the child from his foster parents, whom he's lived with since days after his birth. But the judge will need to scrutinize that plan carefully. Sadly, now that Oregon DHS has been humiliated twice, the agency has even more of an incentive to see this family fail. Fabbrini and Ziegler will be under a microscope, with caseworkers ready to swoop in at any moment. It won’t be easy, but the judge will have to force DHS to change its approach from wagging fingers to helping hands. She will have to demand that DHS extend this family all of the help they need to raise their children. As I wrote in this column for Youth Today, no one – no one – raises a child independently. Amy Fabbrini and Eric Ziegler shouldn’t have to either. UPDATE, JANUARY 5: WitnessLA has reprinted this column, and editor Celeste Fremon has added an important postscript adding national context to the issue. And there is a good story about the Oregon case and others like it in Pacific Standard. Last month, the Oregon Department of Human Services deployed three lawyers to call 40 witnesses over 11 days in a desperate attempt to keep one child in foster care. They had confiscated the child, at birth, from Amy Fabbrini and Eric Ziegler. Fortunately, they failed. After ten months in foster care, the child was returned to his parents. But DHS will be back in court this month trying to terminate Fabbrini and Ziegler’s parental rights to their other child, who has been in foster care for four years. Oregon DHS is an agency where people constantly whine about how overworked and underfunded they are. So surely any couple who would bring so much legal firepower down upon them must have done horrible things to their children. But what? Did they beat them? Torture them? Try to sell them on the street for drugs? In fact the parents never abused or neglected their children at all. Translating from child welfare-speak to plain English, that really means: Now that they’ve gone public it will be really, really humiliating for us here at DHS if we lose -- especially since, in Oregon, court hearings in these cases are open and everyone will be able to see what we’ve done to this family. In fact, it’s likely that the only way the family stood a chance was to go public. But I think that’s why the Oregon Department of Human Services is trying so hard to Make. Them. Pay. Indeed, this is not the first time Oregon DHS has gone to great lengths to seek vengeance against a family that made the agency look bad. Because these hearings are open in Oregon, Swindler could cover the court hearing where Judge Bethany Flint returned the younger child, Hunter, to the parents. Over the course of 11 days Judge Flint heard a litany of non-horrors about the parents: They had to be told to put sunscreen on the baby’s arms, not just his face! Their home “smelled of dog”! They chose the wrong snacks for the child! At one point [a lawyer for DHS] argued the couple's housing permanency – they live in a house with the mortgage paid by Ziegler's parents – was a sign of deficiency. "Going through the rental and purchasing processes show a level of functioning and a level of ability that would be important to look at," she said. The judge’s view jibes with that of a neutral outside observer who spent a lot of time with the family. Sherrene Hagenbach is a professional mediator and a member of the Board of Advisers for Healthy Families of the High Desert, a home visiting program for new mothers. She’s also a volunteer visit supervisor for DHS – or rather she was. Before Hunter was born, she was assigned to supervise visits between the parents and their older son, Christopher. But after she testified in court in favor of the parents, she says her supervisor said her services no longer were needed. In my professional opinion, after multiple sessions observing Amy and Eric interact with their son for hours on end, I found no reason they should have had their child taken from them and placed in the State’s care. … I would also add that it was apparent from their body language and how they treated each other that the couple was in love, and while that is not a requirement to be a parent, it’s a big bonus for a child. 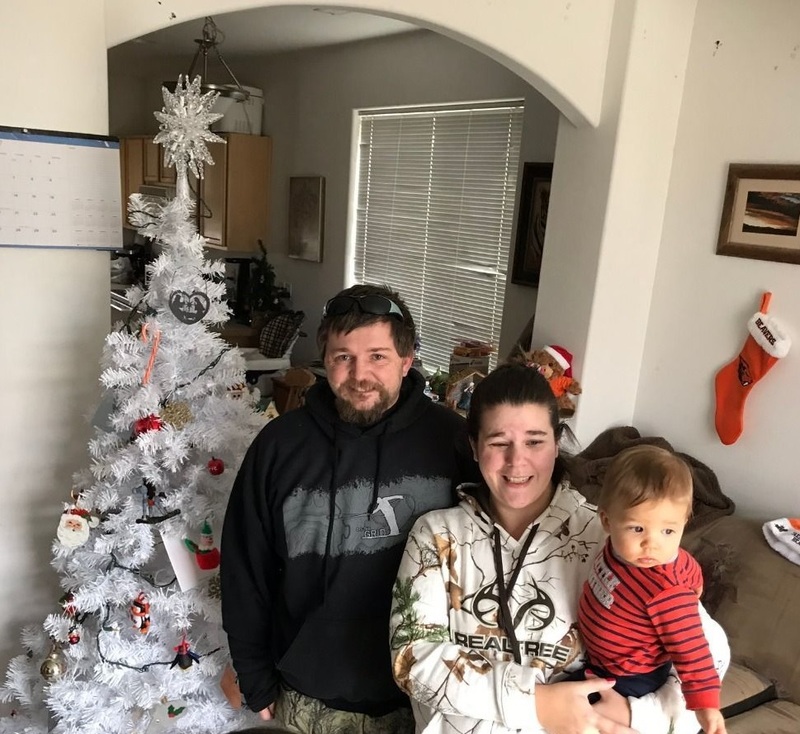 Hagenbach writes that when Hunter was born she offered to take in the entire family – the infant and her parents – and supervise them around the clock. She says a judge ordered DHS to do a background check in preparation for that placement. Somehow DHS never got around to it, and the placement never happened. Hunter was placed with strangers. 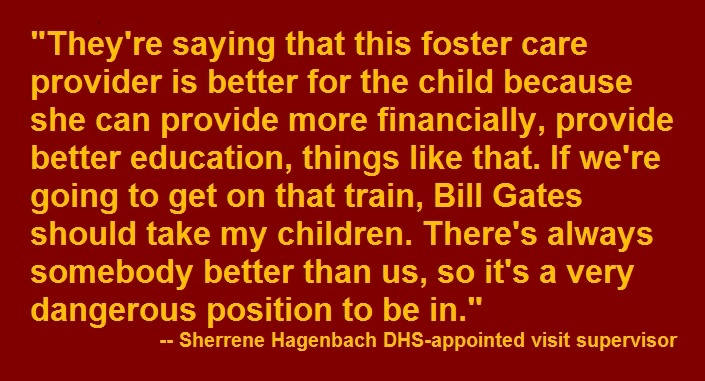 "They're saying that this foster care provider is better for the child because she can provide more financially, provide better education, things like that. If we're going to get on that train, Bill Gates should take my children. There's always somebody better than us, so it's a very dangerous position to be in." The parents jumped through every hoop DHS put in their way. They took courses in parenting, CPR, first aid and nutrition – probably leaving them better qualified to meet their children’s needs than many parents with higher IQs. Even Judge Flint may have fallen into this trap. Though she returned Hunter to his parents, she expressed concerns about doing the same for the older child, Christopher, because he has developmental problems and the judge isn’t convinced that the parents fully understand those problems. But if the parents were middle-class, they could hire whatever help they needed for the child. Middle-class parents are not expected to raise their children with no help. Of course since they can’t necessarily afford to pay for the help on their own, that means taxpayers would foot the bill. But it would be a bargain. An Oregon group that promotes adoption estimates that a year of foster care costs taxpayers at least $26,600. 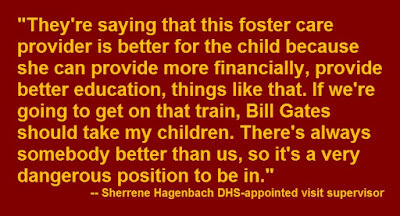 (Obviously not all of that is going to the foster parents, a lot of it goes to support the whole DHS foster care bureaucracy.) These children have been in foster care for a combined total of about five years. That’s $133,000 wasted – and counting, since the older child is still in foster care. Add to that the cost of all those lawyers, and the expert witnesses and the court time and, well, you get the idea. You could buy a lot of parenting help for that kind of money. No doubt, these parents will need outside help to face the challenges ahead. How much heartache could have been avoided if the state had opted to, say, provide a parenting aide to coach them rather than a case worker to criticize them? Oregon spends on child welfare at a rate more than 55 percent above the national average. That’s largely because it wastes so much money on needless foster care, taking away children at a rate 30 percent above the national average. 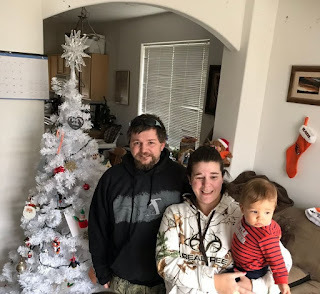 So the next time people in Oregon complains about how overworked the good folks at DHS are, ask them why DHS wasted so much time and talent needlessly tearing apart this family instead of providing them with help. And the next time they whine about how underfunded they are, ask them why they wasted so much money needlessly separating these children from their parents. And one other question comes to mind: Wasting all that time and money and inflicting all that unnecessary trauma on a family isn’t very smart. Has anyone given the decision-makers at DHS an I.Q. test?